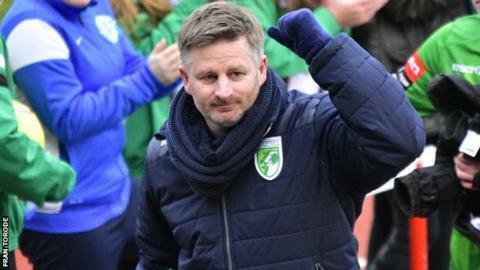 Guernsey FC manager Tony Vance was proud of his depleted squad despite their 1-0 loss at Corinthian Casuals in Isthmian League Division One South. Ross Allen had an equaliser disallowed for a foul on the goalkeeper. "We had incredibly low resources, but the effort the boys put in they deserved something out of the game," Vance told BBC Radio Guernsey. The islanders, who had just 16-year-old Seb Smeed and goalkeeper Jakub Machlowski on the bench, remained fifth in the division, occupying the final play-off place. "Ultimately we lost the game through two bits of handling," Vance said. "I couldn't see the handball personally, but when you see the reaction of the players and what they said at half-time, and the fact that the forward was laughing, that tells a story. "That bit of handling cost us, and then up the other end we scored what looked like a legitimate goal and that got given as a foul on the goalkeeper by him having the ball kicked out of his hands. "I'll always say officials don't cost you the game, and they didn't as we missed some chances and should have done better, but those decisions didn't help us."